As areas of rest and relaxation, every bedroom in your home should be a place that makes you breathe a bit easier once you open the door. A key aspect of any bedroom is the bed. The bed is not only a focal point for the room, but it is also the most necessary piece of the bedroom. If you find that your bedroom is low on space, but you need a bit more room than a twin bed can offer, consider buying a full size bed. A full bed has a relatively small footprint but still provides a comfortable sleeping experience. With a variety of high-quality full size bedframes, footboards, and headboards, Badcock has the perfect full bed for your bedroom. 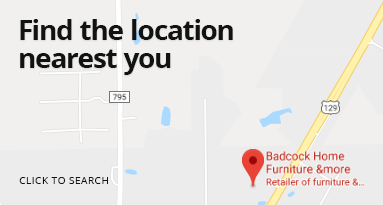 Badcock has plenty of full size mattresses and full box springs to complete your perfect bedroom. Badcock makes buying a great full bed easy with in-house financing. Bring the excitement of the outdoors inside with our Austin bed. Constructed of durable tubular steel , it’s built for survival. The Tristen metal bed has rounded shoulders with flat crown lines, smooth vertical tubular spindle centers, and metal side rails and bedding support slats. Available in twin, full, queen and king sizes. This charming full bed is constructed of Rubber Wood with Birch and Acacia veneers and finished in a gorgeous warm chestnut. Soft corners combine with the streamlined and elegant design of the bed to make for safe, bump free bedtime! The pared-down chic aesthetic of this full sleigh bed will bring elegance to any décor for years to come. This transitional bed is constructed of Okoume wood fronts and select Asian hardwoods and finished in sleek black, giving it the perfect mix of exotic flare and traditional shapes to put a little spice back in your bedroom décor. Encourage your child’s love of the outdoors while keeping up with the latest trends. You’ll love the classic craftsman style, clean lines and rustic, distressed grey finishes. Twin and Full/queen size panel headboard available. Fall asleep in an oasis of tasteful design. This gorgeous bed is covered in beige fabric, has splendid antique brass nail-head accents, four slats with center-support legs and a headboard that adjusts from 56” to 59” to accommodate different bedding preferences. It is one of the few pieces where its utility matches its immaculate beauty. The cherry finish of these Forrester collection pieces feature open plank headboards that can be dressed up for a more mature feel in your guest room, or add a more playful setting for your little one. Versatility is the keystone of these headboards as they are perfectly at home in any decor or setting. Pair them with the available dresser and mirror, chest or nightstand and complete your child’s room for a great value! Trundle or underbed storage sold separately. The cherry finish of these Forrester collection pieces feature open plank headboards that can be dressed up for a more mature feel in your guest room, or add a more playful setting for your little one. Versatility is the keystone of these headboards as they are perfectly at home in any decor or setting. Pair them with the available dresser and mirror, chest or nightstand and complete your child’s room for a great value! This group includes the 6 drawer storage unit. Mattress not included. The cherry finish of these Forrester collection pieces feature open plank headboards that can be dressed up for a more mature feel in your guest room, or add a more playful setting for your little one. Versatility is the keystone of these headboards as they are perfectly at home in any decor or setting. Pair them with the available dresser and mirror, chest or nightstand and complete your child’s room for a great value! This group includes the twin trundle unit and the 3 drawer storage unit. Mattress not included. This twin over full bunk bed features a merlot finish, a slanted ladder for top bunk entry and guard rails. Under bed storage option available but sold separately. Other pieces sold separately. The solid wood construction of this twin over full loft bed is topped off with a rich merlot lacquered finish and is a hallmark of strength and durability, style and function for which loft beds are known. The loft bed with twin and full beds provides six large drawers of storage and a bookshelf for the optimal use of space in your child's room. All drawers have European roller guides for ease of use and durability. The bed is mattress ready with complete slat kits. Other pieces sold separately. The Grace Youth full bed is charming and inviting and brings lovely Victorian cottage ambiance to every young lady’s bedroom space. Pleasing design features include delicate string-of-pearls beaded trim, floral motif overlay ornaments, and graceful S-curve crowns with shell carvings, plus the repeated use of oval shapes. The Grace Collection is constructed of solid pine and quality wood products with a clean white paint finish. Sweet dreams begin with this lovely panel bed that appears straight out of a fairy tale. The headboard and footboard feature delicate string-of-pearls beaded trim, floral-motif overlay ornaments and graceful s-curve crowns with shell carvings and elegant oval shapes. It is available in twin and full sizes. This Twin-over-Full in bunk bed with a built-in ladder and optional storage or trundle has a stunning charcoal grey finish sure to keep both you and your child happy for years to come. With guard rails to prevent falls. This collection has the versatility to handle one child or many. Plus, when you throw in the gorgeous matching desk, chair and hutch, this youth set is the perfect choice for any kid. Storage and/or Trundle sold separately. Looking to save space but still give your child a stylish new bunkbed? Then look no further than the full bunkbed from the Jake Collection. With its simple, sleek and compact design this Full-over-Full bed has a brilliant silver finish and is the perfect way to update your child’s room. Treat yourself to a stylish siesta. With a vibrant antique brown finish, this is a bed that is sure to impress. Durable Asian hardwood and poplar solids give the frame excellent durability, and its design perfectly embodies the space where modern design meets classic sensibilities. You’ll sleep easy with such an aesthetically pleasing and well-crafted bedroom centerpiece. Inspired by French classic Louis Philippe furniture, the Lewiston full bed offers grand silhouettes, subtle curvatures and striking design. Trim and streamlined, this full bed presents a contemporary version of the ever-popular Louis Philippe style. Constructed of quality engineered wood products and simulated wood grain laminates finished in a sleek cherry color. The sizeable headboard of this full bed allows for placement of decorative pillows so your bed always looks as fabulous and stylish as you. Stretch out in serenity with our lovely Lewiston Bed. The grey finish offers a unique option for creating a one-of-a-kind bedroom. 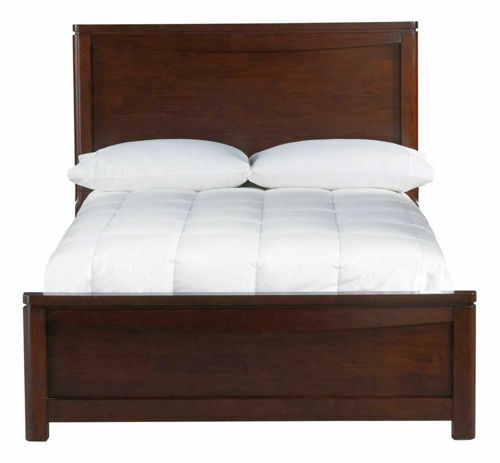 It has a pared-down sleigh bed profile and is available in Twin, Full, Queen and King sizes. Contemporary in style this bedroom is the perfect solution. The sleek contemporary lines will create a bold centerpiece in your master bedroom. 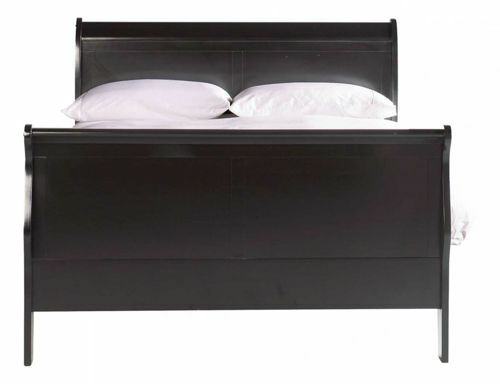 Square legs support the bookcase headboard and the rails are, making it a truly seamless design. This modest look will give your bedroom a trendy look. Bunk beds have always been space savers, but with this collection optional underbed storage and 4 drawer chest to the side of the stairs to the top bunk, you stretch your dollar even further. The traditional ladder has been updated with a safer stair step and the bottom bunk comes in a full size option making this bunk bed perfect for siblings of different ages, which means a longer furniture lifetime and an easier time on your wallet. Finished in grey this all in one kids bedroom solution is an easy addition to any existing decor but can also be the foundation of any design and will surely adapt to your growing children’s needs. Mattress ready. Stairbed is reversible. Trundle or underbed storage sold separately. Bunk beds have always been space savers, but with this collection optional underbed storage and 4 drawer chest to the side of the stairs to the top bunk, you stretch your dollar even further. The traditional ladder has been updated with a safer stair step and the bottom bunk comes in a full size option making this bunk bed perfect for siblings of different ages, which means a longer furniture lifetime and an easier time on your wallet. Finished in merlot this all in one kids bedroom solution is an easy addition to any existing decor but can also be the foundation of any design and will surely adapt to your growing children’s needs. Mattress ready. Stairbed is reversible. Trundle or underbed storage sold separately.